“These are political times. To write a political book now is to dive into a polarized, emotion-filled, loud, and bawdy scrum. It is difficult to be heard and the voices are unforgiving. Travels in Cultural Nihilism is not an exception to this loudness. Rather, it is a loud political book that breaks the routines of shouting, both by raising issues we have become deaf to, but also by shouting in the rather unique voice of a linguistic anthropologist. For those who are tired of the same political pundits, the repeating news channels, and the bloggers and journalists who seem to say the same things over and over again, Stephen Leonard’s account is a welcome shift to cultural analysis. Given these unpredictable and divisive political times, a book about the collision of politics and culture might be able to makes us ask new questions about our methods of shouting. Such new questions span both form and content, as the genre of this book creates its own set of dilemmas. Is it a eulogy? Is it a rant? Is it a stand-up comedy routine? The answer to this depends upon which page one lands on, or which of the various essays one turns to, and which T.S. Elliot quotation appears. If our ability to predict the next amazing political scene is now routinely challenged by the unpredictability of events, then Leonard’s narrative form matches the zeitgeist: it is, indeed, a fast-moving journey, and at no point does anything become predictable. Even the ending is only an enigmatic pause “at the brow of the hill.” What might be over the next hill, or around the next corner, is not necessarily the most memorable thing the reader will take away. Rather, it is the shape that the path takes in its entirety, with so many fast-moving blind corners creating a multidimensional world with thematic links that only make sense by enduring the whole journey. Do not, in other words, stop half-way through. Like eulogies, rants, and stand-up routines, sometimes endurance is indeed necessary. But again, this form of narrative also matches the times: there is a lot to endure at the present moment, and that is the author’s worry. Will we endure all this clumsily, and blindly, and turned away from the core of the problem? Or can we be rattled into calling things by their proper names and doing something to change course? While this book breaks apart many categories, it is loosely akin to those recently proliferating efforts seeking to diagnose the reason why our old political realities suddenly seemed to change course, overtake our lives in new ways, and create seemingly unparalleled amounts of shock, anger, horror and resentment. (The author seems to harbor a bit of each.) By turning to the problem of lost culture as an anthropologist, however, Leonard is indeed able to unmask things others have missed. It might seem like a jarring transition to turn to Swedish political correctness, Brexit politics, and immigration after having recently written two books about doing field work in the Arctic, where Leonard spent a long and dark winter trying to record the dying language of the Inuit. The core worry in Travels in Culture Nihilism, however, is actually quite similar to the worries he faced in the Arctic: there is some part of our own culture currently dying, many aspects of our own languages have been corrupted, and contemporary politics only exacerbates the attendant sense of loss. The Inuit have had a close-up view of the ecological crisis as their homes literally melt away into the sea, and Leonard’s concern about the melting away of culture, tradition and natural spaces transposes the Inuit experience to peoples living farther south. The deft analytical hand of an anthropologist with such field experience is singular: no one else would be able to show this parallel with similar authority. The ‘ecological crisis’ might have begun as a reference to the ecology of climate change, but with this account, one can see how the crisis is also about social ecologies, linguistic ecologies and political ecologies. Our alienation from the natural world renders all of us homeless in social, political and linguistic ways. The Inuit notice their homelessness, but Leonard’s point is that those of us dwelling farther south often pay no attention, unable to understand what we are losing. The sound of a eulogy comes from this sense of alienation in the descriptions of change and loss, but also from the title itself: ‘cultural nihilism’ is about things that have died. The term—itself new to the discourse—encompasses the author’s concerns about the annihilation of culture, but also how certain types of newly-created global ‘culture’ can be inherently nihilistic. So ‘cultural nihilism’ has two layers: it is both destruction and creation, perhaps in the same way Nietzsche’s nihilism both destroys and creates. The creation of nihilistic culture (global monoculture unconnected from concrete places) is linked with, but not the same thing as, the destruction of traditional local cultures rooted in family, nation-state, community, and particular pieces of the earth. The deep sadness and feeling of loss that go with the revelation of cultural nihilism become more specific in the author’s descriptions of two cultures somewhat south of the Arctic: British culture and Swedish culture, two worlds he feels he knowns most closely from his own life and work. The accounts of Sweden’s recent devolution towards cultural nihilism are perhaps the book’s most alarming and arresting descriptions, but also where the reader learns the most. All fans of the politically-correct and supposedly well-meaning welfare-state that Sweden has come to represent should brace themselves, as in the eyes of this anthropologist, the Swedish state is not the model to work towards. Rather, Leonard would ask those political scientists romantically attached to Swedish democratic socialism to take their modeling elsewhere, and if the reader still believes in this idea of Swedish political transcendence, only a gut-wrenching sense of loss can follow this argument. He compares the oppressive political correctness in Sweden to the place where the idea of political correctness (politicheskaya pravil’nost in Russian) originated: Stalin’s USSR. Hyperbole aside—and yes, there is much hyperbole bordering on comedy—witnessing the deconstruction of the myth of the Swedish political paradise is the best reason to take a ride through this book. Journeying through the hidden recesses of the northern woods reveals many political paradoxes that have gone unnoticed by the rest of the world. On the streets of small Swedish towns and listening the local radio airwaves, the eulogy merges into a loud rant about the consequences of losing culture. The rant mixes with a bit of comedy, and one almost asks: is this serious, or is this a stand-up routine trying to wake us up? To disclose the substance of the rant would be too much of a spoiler, as the rant cannot be understood without the eulogy and the humor: the combination comes across as the test of endurance forcing us to confront the zeitgeist. Readers should keep in mind that living now means we have to read books as we are now, and in our times, sometimes political anger is both tragic and funny. Everyone right now is ranting—most every Twitter user, Facebook poster, blogger, news anchor, column writer, and even many ‘objective’ and ‘neutral’ academics—we are all ranting. Not everyone is as self-aware as the voice in Travels in Cultural Nihilism, however, and self-awareness is a preciously rare phenomenon these days. The challenge in the midst of all the ranting and shouting, especially if one has preserved any of one’s hearing and not become entirely deaf, is to find opinions that are opposed to one’s own, but still self-aware, thoroughly-argued, and capable of presenting novel information to learn from. The other challenge is finding arguments spoken in a genuinely dissenting voice, because if everyone is saying ‘no,’ can anyone be a real dissident? Leonard’s rant does in fact present novel information and a coherent opposing view, and this has tremendous value right now. Some of it, granted, everyone will have heard before. Yet the particular combination of surprises, if one endures the entire journey and sees the whole structure, adds up to a unique form of dissidence. Especially in those moments where the rant abruptly ceases, and one suddenly finds words of poetic ethnography and micro-descriptions of particular places that have been forever changed by the way we blundering humans are currently proceeding through our political distress, then the reader really does hear something we have definitely not heard before. Perhaps the most remarkable novelty in reading about the political distress of a linguistic anthropologist is hearing an attentiveness to language that few political pundits possess. Leonard knows that we are all wordsmiths now, forging the world through the kind of language we choose, and this loud, brash, overstated language of apocalypse is what we seem to have collectively settled upon to build our echo chambers. While the author goes ahead and uses such wordsmithing himself while ranting, in the paused moments of poetry, a different message comes through: we need to be self-aware that all this ranting will indeed build a harsh, loud, unforgiving world without any nuance, without exceptions, a globalized and universalist language where the intricacy of the world’s beauty is drowned out by our over-emphatic word choice. The reader will notice that some of the author’s own word choices are so over-emphatic that they are funny. But with this combination of ranting, eulogy, and humor, a fuller linguistic picture emerges to make the larger point that pretty soon politics will destroy poetry. That is, unless we learn to listen to the world in a different way. If we only keep ranting, we might find ourselves in a harder world with a bigger audience, and in rattling away the soft ineffectuality of political correctness we might unveil honesty as the ultimate triumph—but if we only ever talk this way, we will then also have to mourn the loss of poetry. We will miss—and probably already miss—poetic words that rise above the chanting normalcy of our angry voices. 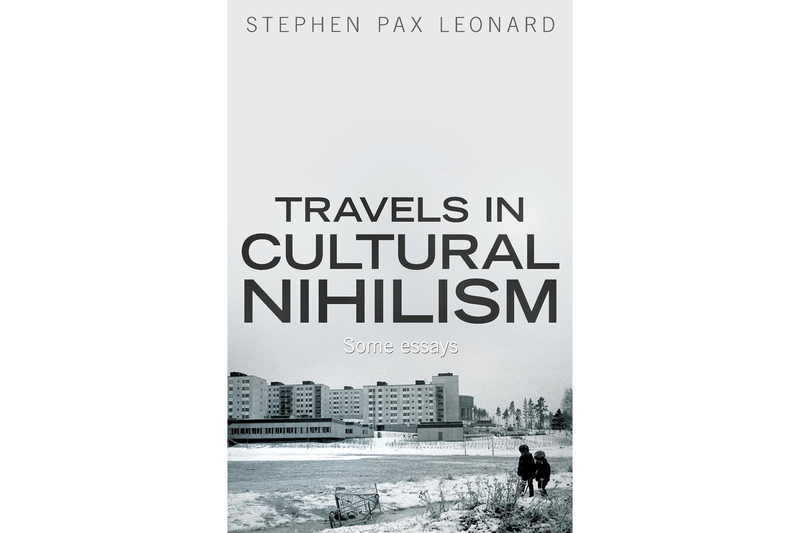 Given this book’s title, the intention seems to have been to reveal how and when cultural nihilism happens, while also pointing out how cultural destruction is accelerated by a certain kind of political world. By the end of the journey, however, one ends up asking a larger contextual question: why did an anthropologist, who is also a published poet, feel the need to turn to writing a book about nihilism and politics? Why do our collective intellectual and cultural resources have to be used to rant about politics, when we could be studying and preserving cultures, writing more poetry, and exercising talents in line with our original vocations? The book itself becomes evidence of one problem it tries to highlight: we have to write about politics now because politics might be destroying everything else. Politics can destroy poetry in a way that poetry cannot destroy politics; politics can destroy culture, and some cultures can destroy certain kinds of politics (especially peaceful democratic politics), and all of this destruction is potentially happening right now, right before our eyes. The forces of destructive politics and cultural nihilism are upon all of us, everywhere, dwelling in the north or the south, on the left or right, conservative or liberal. So, living as we are now, it is sadly the case that the poet, the anthropologist, and the rest of us too—we must, in fact, keep ranting about politics. Yet we also must, therefore, make more effort to understand the rants of others. We may have a sense of nostalgia for a time in our lives when we did not have to deal with all the political ranting, when, as in the last line of Leonard’s conclusion, we could instead “tend to our cabbage gardens.” But those are not the times we live in. Through both its form and content, this book helps us understand the difficult realities of our current political distress, bringing home how totally unavoidable and foundational politics have become for everything else. Journeying through this troubled intersection of politics and culture, Travels in Cultural Nihilism might make the reader cry, fume, and even laugh. By the end, though, such contradictory reactions seem salutary and necessary, matching the spirit of the times, and perhaps even adding up to an enlightening journey we all need to experience”. Dr. Aspen Brinton is a political theorist who has taught courses about dissidence, free speech, and international politics at Georgetown University, Northwestern University in Qatar, and the University of Pennsylvania. She currently teaches in the School of World Studies at Virginia Commonwealth University.